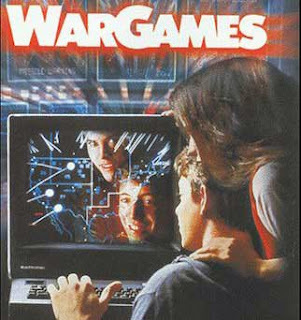 Matthew Broderick and Ally Sheedy star in this 1983 classic about a computer wiz and his girlfriend who accidentally nearly start World War III. David (Broderick) is an underachiever in school but brilliant with computers. He hacks his high school database to change his F's to A's; he hot wires phone booths to bypass the need for quarters; David does not wait until next spring to play the newest games, he hacks into the game programmer's computers and plays them before they're publicly released. The trouble begins when David is scanning (hacking) random computers in search of new games and stumbles upon one system with a whole list of password-protected tactical war games. After some research, he finally cracks into the system and chooses to play one of the games on the list: "Global Thermonuclear War." David and his girlfriend Jennifer (Sheedy) laugh innocently as they play, launching missiles from the Soviet Union to the U.S. and moving submarines and jet fighters into attack formation around Los Angeles and Seattle. But as it turns out, the game they hacked was not a game; it is a sophisticated war simulation program of NORAD's supercomputer/defense system. Meanwhile (in real life), believing the nation to be under heavy nuclear attack, the U.S. Department of Defense prepares its nuclear arsenal to respond in kind. Soon realizing the Pandora's box he's opened, David attempts to shut the game down but to no avail. The "game" simulation he started is designed to play out war strategies, learn from its tactical mistakes, and play until it wins. In this case, winning means the annihilation of the U.S.
And so a battle of wits and a race against the clock begins: David must escape FBI custody long enough to stop the computer and convince the General not to return missile fire on Russia and begin WWIII. My synopsis has massive holes, but it really is a clever movie- sure to keep you on the edge of your seat. Well worth the price of admission when it comes back to theaters in August for a 25-year anniversary showing. Next up: "The Money Pit"